This class include 40minutes of spinning where you can give it all follow by some core and arm work to tone the full body and a short stretch to finish it up. 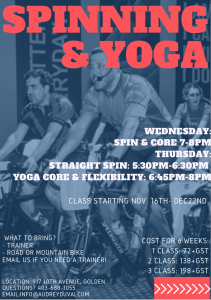 This class is a perfect way to keep you strong for the upcoming biking season or an overall great body workout. Don’t have a trainer? Email us we have a few option on what to buy. 8 week program from Jan 4th to February 22nd.